“Could we have a better metaphor for the way Silicon Valley considers local journalism?” fumed the owner of one of these remaining publications. Êxodo impresso: o que substituirá os veículos locais na era digital nos EUA? Owen, Laura Hazard. "A Boston journalism nonprofit is among the first publishers to sell subscriptions on Medium." Nieman Journalism Lab. Nieman Foundation for Journalism at Harvard, 5 Jul. 2016. Web. 18 Apr. 2019. Owen, Laura Hazard. 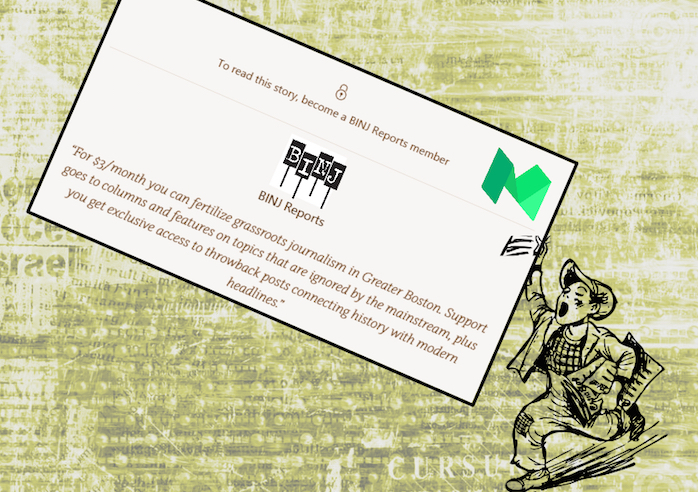 "A Boston journalism nonprofit is among the first publishers to sell subscriptions on Medium." Nieman Journalism Lab. Last modified July 5, 2016. Accessed April 18, 2019. https://www.niemanlab.org/2016/07/a-boston-journalism-nonprofit-is-among-the-first-publishers-to-sell-subscriptions-on-medium/.